I replaced it with another Logitech, which turned out to be quite difficult to find. Turns out most stores only sell cordless mice these days. Why would I want something that depends on batteries to use every day at my desktop? But I finally found another basic corded Logitech mouse (at Office Depot). Brought it home and it worked fine, except that the speed was way too fast, much faster than my old mouse. So I needed to find out how to change mouse speed. X11 has traditionally made it easy to change mouse acceleration, but that wasn't what I wanted. I like my mouse to be fairly linear, not slow to start then suddenly zippy. There's no X11 property for mouse speed; it turns out that to set mouse speed, you need to call it Deceleration. But first, you need to get the ID for your mouse. That's fine for doing it once. But what if you want it to happen automatically when you start X? Those constants might all stay the same, but what if they don't? So let's build a shell pipeline that should work even if the constants aren't. First, let's get the mouse ID out of xinput list. We want to pull out the digits immediately following "id=", and nothing else. Add those two lines (setting the mouseid, then the final xinput line) wherever your window manager will run them when you start X. For me, using Openbox, they go in .config/openbox/autostart. And now my mouse will automatically be the speed I want it to be. It's been snowing quite a bit! Radical, and fun, for a California ex-pat. But it doesn't slow down the weekly hiking group I'm in. When the weather turns white, the group switches to cross-country skiing and snowshoeing. A few weeks ago, I tried cross-country skiing for the first time. (I've downhill skied a handful of times, so I know how, more or less, but never got very good at it. Ski areas are way too far away and way too expensive in Californian.) It was fun, but I have a chronic rotator cuff problem, probably left over from an old motorcycle injury, and found my shoulder didn't deal well with skiing. Well, the skiing was probably fine. It was probably more the falling and trying to get back up again that it didn't like. So for the past two weeks I've tried snowshoes instead. That went just fine. It doesn't take much learning: it's just like hiking, except a little bit harder work remembering not to step on your own big feet. "Bozo goes hiking!" Dave called it, but it isn't nearly as Bozo-esque as I thought it would be. Last week we snowshoed from a campground out to the edge of Frijoles Canyon, in a snowstorm most of the way, and ice fog -- sounds harsh when described like that, but it was lovely, and we were plenty warm when we were moving. This week, we followed the prettiest trail in the area, the East Fork of the Jemez River. In summer, it's a vibrantly green meadow with the sparkling creek snaking through it. In winter, it turns into a green and sparkling white forest. 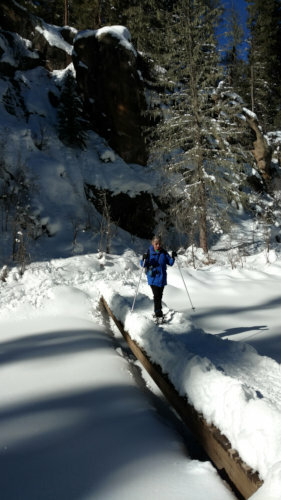 Someone took a photo of me snowshoeing across one of the many log bridges spanning the East Fork. You can't see any hint of the river itself -- it's buried in snow. But if you hike in far enough, there's a warm spring: we're on the edge of the Valles Caldera, an old supervolcano that still has plenty of low-level geothermal activity left. The river is warm enough here that it's still running even in midwinter ... and there was a dipper there. American dippers are little birds that dive into creeks and fly under the water in search of food. They're in constant motion, diving, re-emerging, bathing, shaking off, and this dipper went about its business fifteen feet from where we were standing watching it. Someone had told me that he saw two dippers at this spot yesterday, but we were happy to get such a good look at even one. We had lunch in a sunny spot downstream from the dipper, then headed back to the trailhead. A lovely way to spend a winter day. I'm working on my GIMP talk for SCALE 14x, the Southern California Linux Expo in Pasadena. My talk is at 11:30 on Saturday, January 23: Stupid GIMP tricks (and smart ones, too). I'm sure anyone reading my blog knows that GIMP is the GNU Image Manipulation Program, the free open-source photo and image editing program which just celebrated its 20th birthday last month. I'll be covering an assortment of tips and tricks for beginning and intermediate GIMP users, and I'll also give a quick preview of some new and cool features that will be coming in the next GIMP release, 2.10. I haven't finished assembling the final talk yet -- if you have any suggestions for things you'd love to see in a GIMP talk, let me know. No guarantees, but if I get any requests I'll try to accommodate them. Come to SCALE! I've spoken at SCALE several times in the past, and it's a great conference -- plenty of meaty technical talks, but it's also the most newbie-friendly conference I've been to, with talks spanning the spectrum from introductions to setting up Linux or introductory Python programming all the way to kernel configuration and embedded boot systems. This year, there's also an extensive "Ubucon" for Ubuntu users, including a keynote by Mark Shuttleworth. And speaking of keynotes, the main conference has great ones: Cory Doctorow on Friday and Sarah Sharp on Sunday, with Saturday's keynote yet to be announced. In the past, SCALE been held at hotels near LAX, which is about the ugliest possible part of LA. I'm excited that the conference moving to Pasadena this year: Pasadena is a much more congenial place to be, prettier, closer to good restaurants, and it's even close to public transportation. And best of all, SCALE is fairly inexpensive compared to most conferences. Even more so if you use the promo-code SPEAK for a discount when registering.